Our apricot tree is in full bloom right now. It's lovely. I also love the way the ground looks once the blossoms start falling - a sort of petal snow fall. 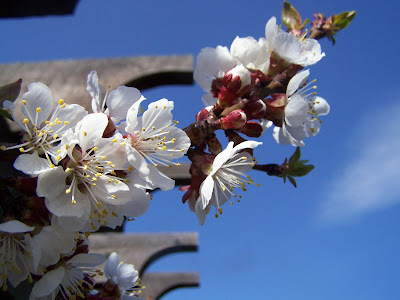 This is just such a delightful time of year - so many blossoms to see and beautiful scents to smell, the sun's rays shining down and warming our winter white skin, the birdsong reaching our ears from up in the trees. A feast for the senses. 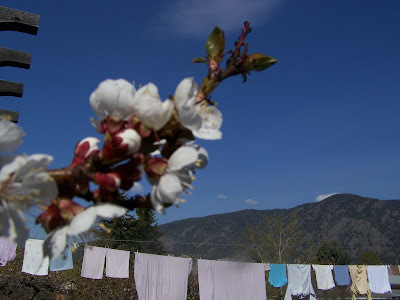 Our cherry trees are also pushing out blossoms so we tend to go from one delightful sight and smell to another just now; it truly is an abundant time of year. 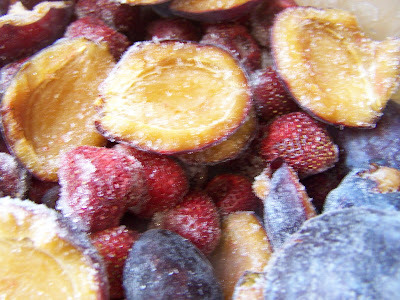 This morning I dug some of last summer's apricots out of the freezer bottom (yes, I'm still working at emptying out our freezers). They even look like golden sunshine...and that is exactly how they taste.I popped them in with the same ingredients from yesterday's nettle smoothie. 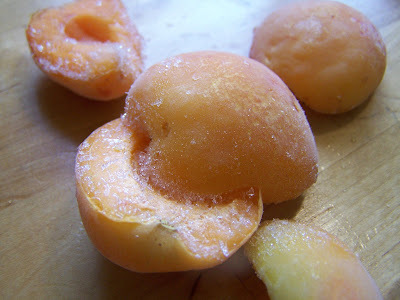 I always freeze apricots halves just for this purpose. 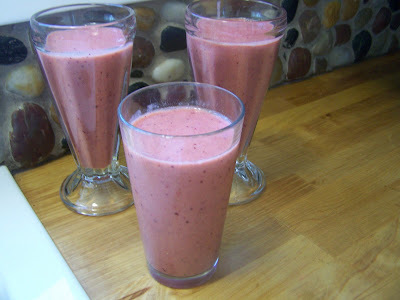 I find they give a sort of mellow creaminess...a smoothness (wink, wink) to smoothies that we quite enjoy. 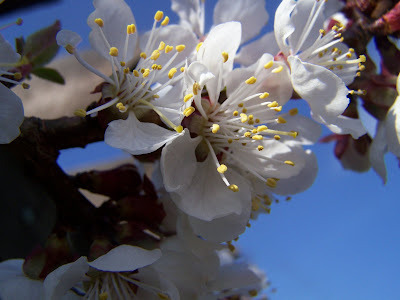 I find fruit tree blooms fascinating and love getting an up close shot of them. Amazing to me to think that these blossoms turn into fruit which we can pick off the tree and eat. 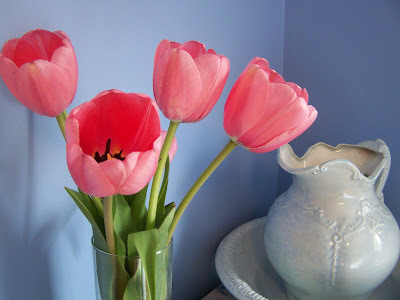 Delight in the flowers, delight in the fruit. And tonight...sun-dried sheets fresh off the line - no matter that they are still flannel because it isn't warm enough for warm weather sheets yet. 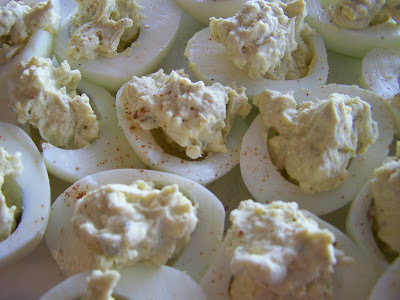 They'll still be delightful. What will you be delighted by today? Nettlejuice left a link to her nettle smoothie post in the comment section on my last post so, of course, I had to try it. 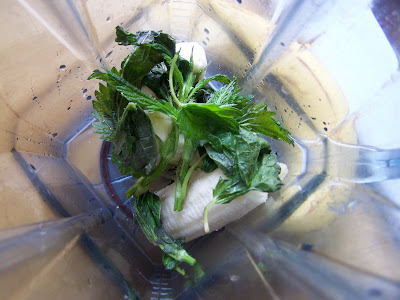 I used banana and nettle tops as she shows. Added some soymilk to blend it until smooth. 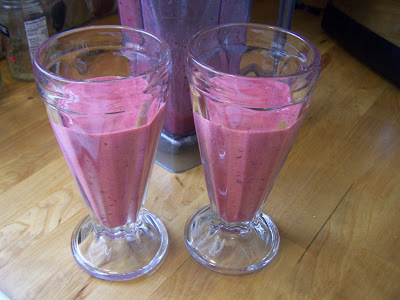 Then added some of my frozen plums and strawberries and whizzed it some more. Delicious!! The boys are happily slurping theirs up right now. 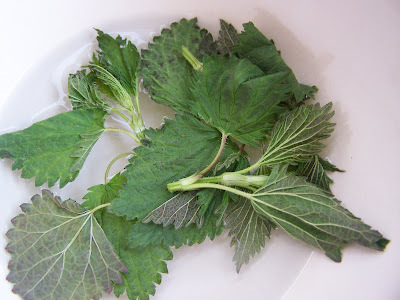 I came home from a friend's house on Sunday with a box full of nettle - such fun to pick wild food with a friend on a sunny day. 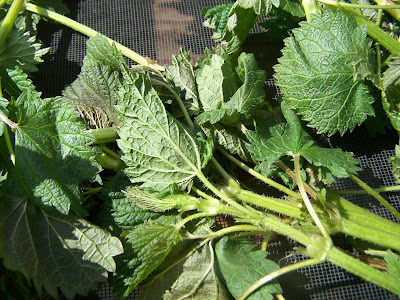 The timing is perfect as my supply of dried nettle from last year has almost run out. 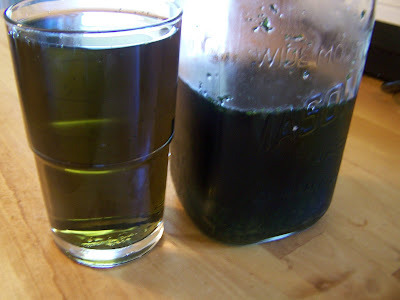 I use it daily for a nourishing infusion and go through quite a bit. 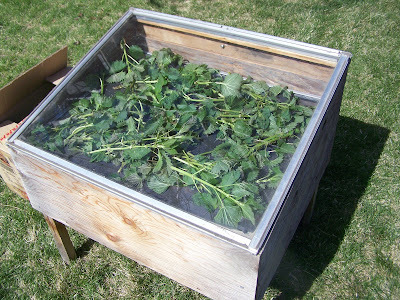 Yesterday I put the first batch into my solar dryer to dry quickly. 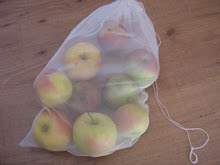 I'll also do some in some brown paper bags since there isn't enough room for it all in the dryer and then take some to a friend for her to juice. And some will be eaten cooked in pasta sauce too, this is a lovely green to eat until our own Lamb's quarter is ready to pick. I love this time of year when there are so many wild greens coming to life. Earth Day, Dandelions and Dogs...Oh My! We spent the afternoon at the beach for Earth Day (well, except for the latter part of the afternoon which was spent hunting for our neighbour's lost dog for hours, finding him, getting bitten by him, and then bringing him home on my bike once he had calmed down from his ordeal and returned to his normal lovely self). 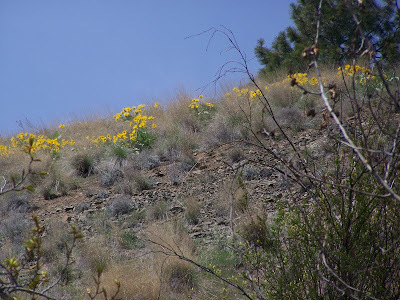 The beach near our house is surrounded by dry rocky slopes - the perfect environment for Arrow-leaved Balsamroot flowers. The hillsides there are so beautiful right now. E had his plant book with him and I had mine so we were identifying edible plants. We tried a little nibble of the balsamroot leaf as all parts of this plant are apparently edible, we found them to be very bitter. 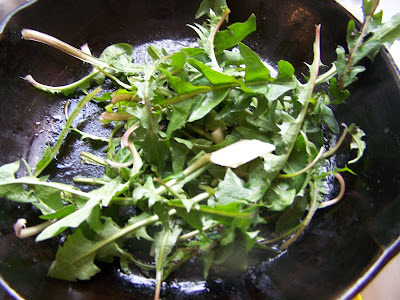 While we were soaking up the sunshine sitting on our blanket E thought up a recipe that he wanted to try with some dandelion greens. 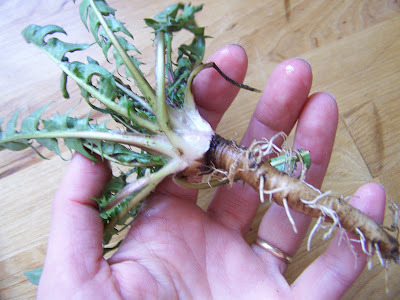 The minute we got home he disappeared into my garden and came in with a whole bunch of dandelion plants - roots and all. He washed and trimmed a few of the greens and then cooked them up just so. He heated some olive oil and then melted some butter in it (for extra flavour, he says) then sauteed the greens until wilted. He added a squeeze of fresh lemon juice and sauteed for another couple of minutes and then sprinkled some grated Romano cheese on top. It was quite good (although W wasn't impressed). E ate some of it as is and then decided to mix the rest in with the pasta that I had made for dinner. 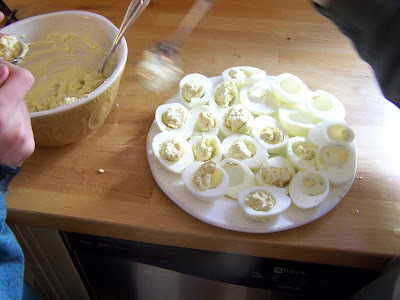 I liked it that way as well so then we had to make a bit more so I could have some in my pasta as well. How much do I love that my 9 year old thinks up recipes for wild food and then immediately makes them and, not only that, but enjoys them? So much more than I can say. Hello...my name is Heather...and I'm...an edger. It's true. I'm addicted to edging(that's my favourite edger below). I have such a hard time stopping myself. 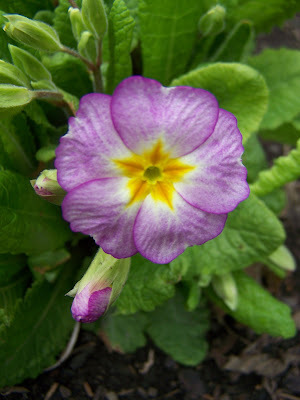 This addiction has served me well in years past though as it serves to make my perennial beds bigger and bigger. That can't be a bad thing. ;-) I think the thing of it is that it just makes all the gardens look so tidy and pretty, who can resist that? 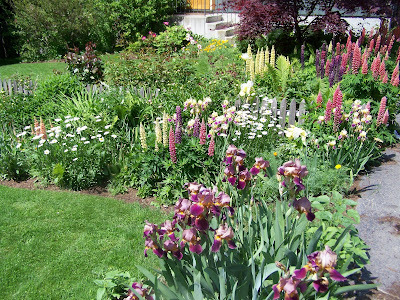 While I was out there edging I couldn't help but think that before I know it this area... will look like this. Truly, I find gardening to be just magical. 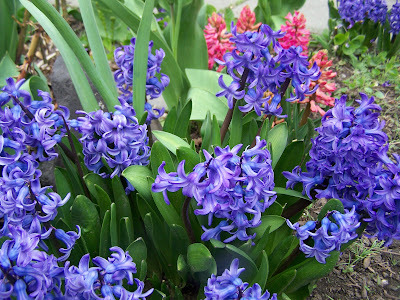 The hyacinths are in bloom and their scent is combining with the scent from the carpet of violets we have up front. It is absolutely delightful. All the blossoms seem to be attracting the bees. And this? 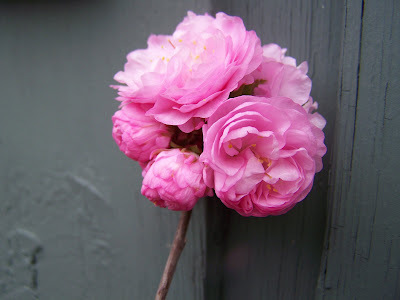 This is one of my favourite flowering shrubs (there are many). 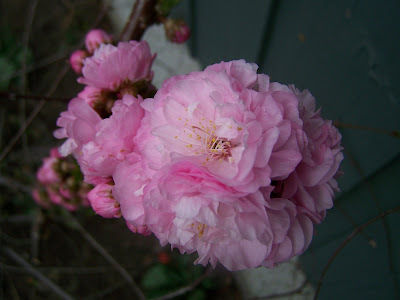 It is a double flowering almond tree. Each year, when it is in full bloom (see here or here), I take a photo of the boys standing in front of it. 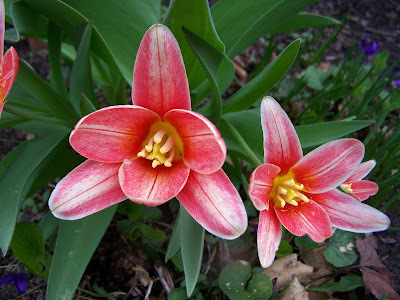 I love to see how much they grow from year to year, not to mention the changes in our house and gardens year to year. It isn't in full bloom yet but I couldn't resist taking some photos of the bits that are in bloom. 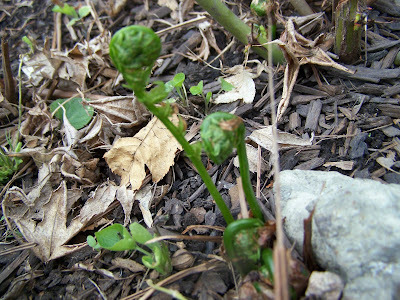 Spring seems late this year and all my plants are somewhat behind but things are picking up now and the ferns are starting to come up too, I love seeing the way they unfurl. Life really is good. 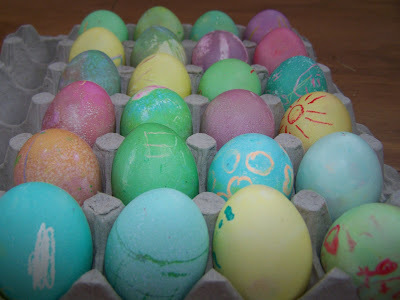 Whatever happens to all those Easter eggs? 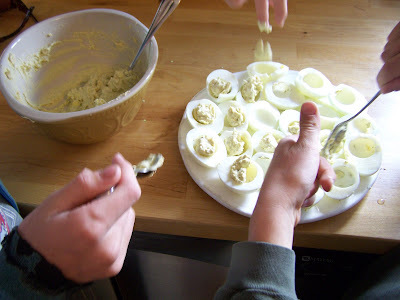 In our house they get turned into deviled eggs...and then quickly gobbled up by two boys. 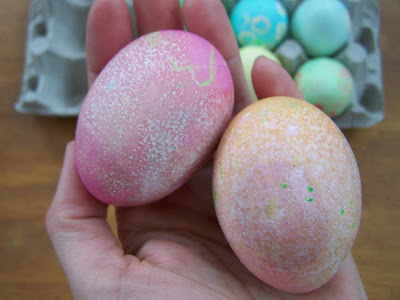 Part of my family's tradition when I was a child was to dye eggs each year. I love doing this and have continued this tradition with my own boys. Every time we do this we wonder why we only do it once a year - it's just so much fun. Last night I went to get my PJs out from under my pillow at bathtime and found a nice surprise there. W came in and found my treats all lined up along my bedside table and asked where they had come from. I told him that I had found them under my pillow. (Very Exciting!) 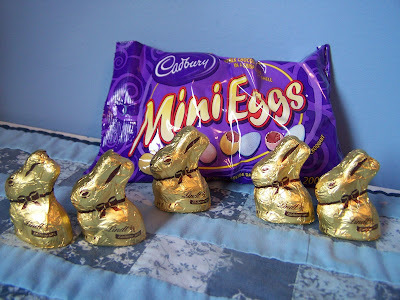 He looked at me for a second and then remarked that they (he and E) had spent ages looking everywhere for eggs and chocolate and I had managed to "find a whole parade of chocolate" (his words) Right Under My Pillow. ;-) I think he thinks I must have an in with the Easter Bunny. Time seems to be flying by for our family right now. We whiz through the week without really even knowing what day it is until Friday hits and then we seem to look around at each other and ask with disbelief "It's Friday again already?". 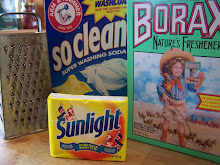 We have lots going on right now so blogging was the first thing to lose priority. 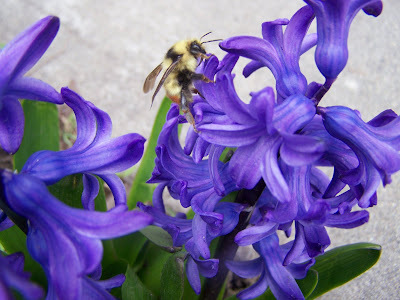 I thought I'd catch up a bit by posting some photos of what has been happening in our yard. Our back walnut tree has been playing host to a few varieties of birds. 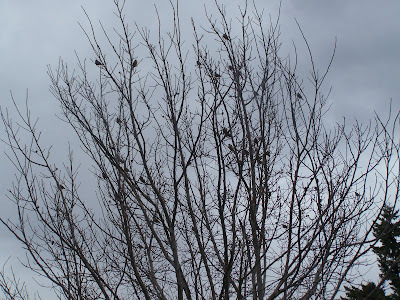 One morning it was filled with Bohemian Waxwings. One of them flew into our sunporch window and did not recover. It was such a gorgeous thing that we couldn't resist taking some photos. 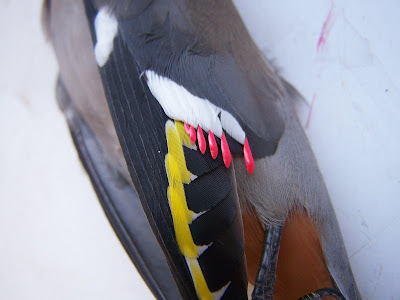 Not sure if it is considered PC to post dead bird photos so I won't but we were really impressed by its colourful tail feathers and especially the six tiny little red feathers it had on each wing. Oh, why not...a picture is worth a thousand words, after all. :-) Isn't it beautiful? Then the Robins came in and took over the tree for awhile and now the crows seem to have marked it as their hangout. 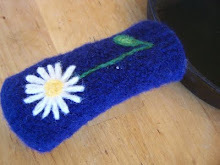 Yesterday I started searching out some dandelions to use for a bit of a Spring cleanse. I eat the leaves and use the roots for tea. All the better for ensuring my neighbours think I'm nutty. ;-) I think I'm the only one in the neighbourhood actually looking forward to dandelion season. 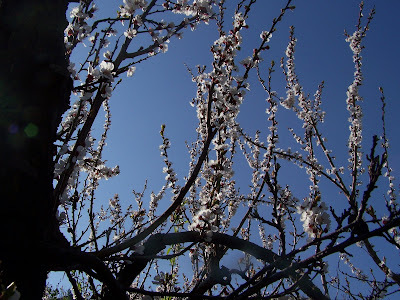 The fruit trees are pruned except for the apricot and cherries. 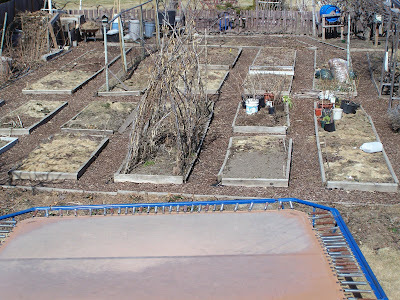 The garden beds are ready to be planted, the first batch of peas are in and my garlic (planted in November) is starting to grow. 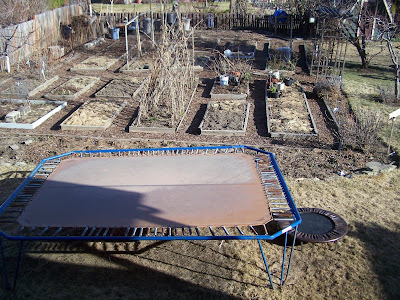 I'm not putting compost on top of each bed this year. 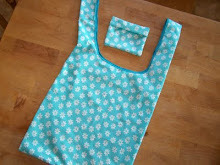 I'm saving it in the recycled bins S brought me from the dump and then can top dress as needed or make compost tea. 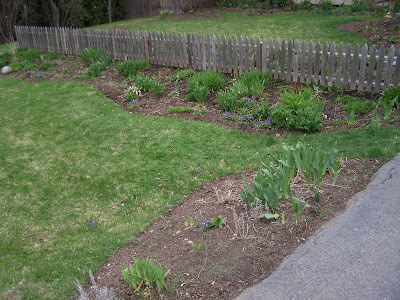 This photo shows my mulched beds and I just can't express how much I love mulch. 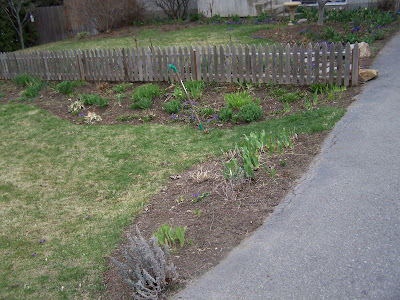 When I first moved here 10 years ago I didn't know about mulching, each Spring I spent hours and hours just trying to get rid of the weeds that absolutely covered the soil. Now, with permanent beds, good pathways and mulch put on each Autumn, I find garden prep to be pretty minimal. Here is a closer up photo. The compost bins are at the back and still in the process of being emptied out. 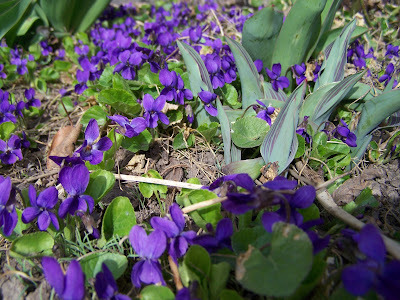 Everywhere in the front yard smells of violets right now. I LOVE that smell! 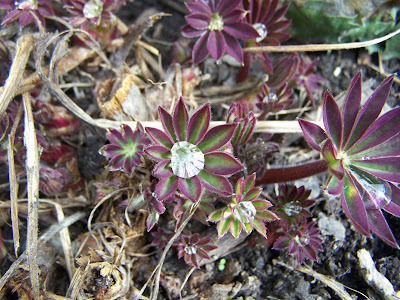 And the Lupins are starting to pop up everywhere again. It won't be long until the yard looks like this again and I feel the urge to re-read Miss Rumphius with the boys.